Location: Agonges, in the Allier departement of France (Auvergne Region). Notes: Château de l'Épine is located in the town of Agonges in the department of Allier in France. It is the subject of a registration as historical monuments since March 5, 1992. The fortified area of ​​the spine is now one of the few examples of this type also well preserved in Bourbonnais. 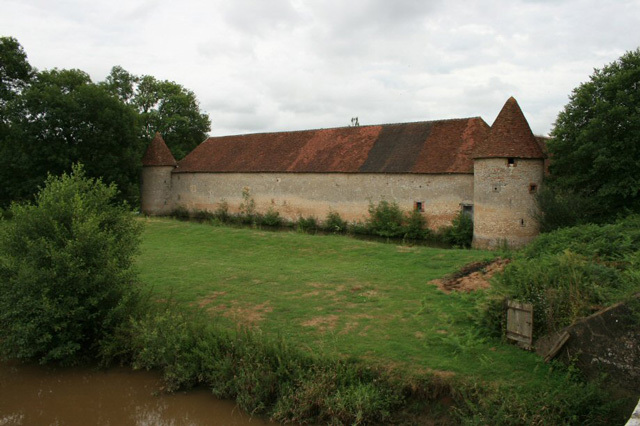 It is a set of square plan, organized around a courtyard bounded by the house, barn, stables and sheds, all surrounded by a moat. Thus, the old castle is in the form of an almost perfect quadrilateral, indicating its angles the four cardinal points, surrounded by a moat, still water, and near a river, Burge, whose name was used to rename Bourbon-Archambault during Revolution. yet it is accessed through the front door or the arched entrance postern, formerly preceded by a drawbridge. At first glance, the only remaining three of the four towers at the northern corners, west and south of the building. Now, if we could have thought he was a fourth in the East, yet nothing attests and the very absence of foundations on the site poses a doubt as to his past life. Moreover, remain fit some of the walls, pierced by loopholes at different heights, and serving as supports for houses and barns. The oldest part is the set that forms the southwest tower to the left of the entrance, and the small building adjoining it. The latter still has a stone mullioned window and an opening oldest side road. The fireplace was on a bread oven which is still distinguishes the opening. The ground floor of the tower was to be the chapel, with its vaulted room, the only one in the house, breakthrough five small windows and a door arched. Above it was the loft is accessed by a staircase and you can see a two-storey structure, radiating around a high punch. The uppermost stage of this assembly has the appearance of a conventional wheel. The second wheel of the frame, lower down, is distinguished by rays coming not from the central axis, but a thick wood frame square around this axis, halving the length of the rays as the castle Bordes. In walls, are housed putlogs, cylindrical pigeon nests, terracotta as the castle of Moncoquet in Châtel-de-Neuvre.